Focal nodular hyperplasia (FNH) is a benign tumour-like lesion consisting of hyperplastic parenchymal nodules with abnormal vessels associated with a central stellate-shaped scar. Most of them occur in women of reproductive age but cases have been described in men and children also. FNH accounts for less than 2% of paediatric hepatic tumours and 0.02% of all tumours.,, Although there are case reports on congenital FNH, diagnosed on antenatal USG,,, it is an unusual liver tumour in children younger than 2 years of age. We present two cases of paediatric FNH— the first case being reported in a 5 month old infant. Initially, the second case posed diagnostic difficulty, but was correctly diagnosed after histopathological examination of the resected mass, highlighting the fact that it is difficult to establish the diagnosis of FNH in small tissue samples such as liver biopsy. A 5-month-old male infant presented with diarrhea of two weeks duration. His perinatal history was unremarkable and he had been delivered by elective caesarian section at term gestation. His routine investigations were within normal limits but an ultrasonogram (USG) of the abdomen revealed a solid inhomogeneous mass in the left lobe of liver. On magnetic resonance imaging (MRI), the mass appeared to be mildly hypointense on T1 weighted sequence (T1W) and isointense on T2 weighted sequence (T2W), with homogeneous contrast uptake on the arterial phase [Figure 1]a. Serum alpha-fetoprotein (AFP) level was normal. The possibility of hepatoblastoma appeared less likely and hence no preoperative neoadjuvant chemotherapy was administered. The mass was surgically excised and sent for histopathological examination. Grossly the mass measured 9 cm in greatest dimension and appeared to be subdivided into smaller nodules by bands of connective tissue [Figure 1]b. Microscopic examination revealed bands of arborizing fibrous connective tissue septa subdividing the liver parenchyma into nodules of varying sizes [Figure 1]c. The nodules were composed of bland hepatocytes. The fibrous septa contained several thick walled vessels of arteriolar calibre, some with eccentric subintimal thickening. The fibrous septa appeared to originate from a central scar like area [Figure 1]d and [Figure 1]e. Immunohistochemistry for glutamine synthetase showed characteristic map-like areas with perivenular distribution, thus confirming the diagnosis of FNH [Figure 1]f. The last prenatal USG of the mother done at 37 weeks gestation was reviewed, which did not show any mass lesion in the liver of the fetus, thus excluding the possibility of congenital FNH. The child has been followed up for 2 years now and is doing well till date. A 6 year old male child presented in the outpatient department of Pediatric Surgery for evaluation of an abdominal swelling of one year duration. He had undergone a battery of investigations at a different institute including USG which revealed a space occupying lesion (SOL) in right lobe of liver measuring 4.5 cm × 3.2 cm. Serum AFP level was normal. A trucut biopsy had been performed from the SOL around three months back which suggested the possibility of hepatoblastoma, on the basis of which he had received two cycles of neoadjuvant chemotherapy with vincristine and doxorubicin. As there was no response to therapy, he had been referred to our institute where he had been re-evaluated. On physical examination, the child was anicteric but had pallor. Complete hemogram revealed a haemoglobin level of 7 gm% and total leucocyte count of 2500 per cumm. Per-abdominal examination revealed a huge, right upper quadrant lump extending from right subcostal region upto the umbilicus, crossing the midline. A repeat serum AFP was done which was again within normal limits. A contrast enhanced CT (CECT) scan was performed which showed a large mixed density mass in the right lobe of liver with presence of a focal hypodense area in the centre of the lesion. The mass showed homogeneous contrast enhancement while the hypodense area was non-enhancing [Figure 2]a. The slide or block of the trucut biopsy done previously was not available for review. As such, the child was prepared for surgery and the resected specimen was sent for histopathological examination. Grossly the mass measured 12.5 cm across and weighed around 1100 grams. On slicing, the mass was composed of several tan coloured nodules of varying sizes, bulging from the cut surface, with a central arborizing, depressed scar [Figure 2]b. There were no areas of hemorrhage but an ill-defined area of softening was noted at one place. Microscopy showed nodules of varying sizes composed of normal, uniform looking hepatocytes separated by fibrous bands, along with attenuated endothelial cells and Kupffer cells. Portal tracts and central veins were practically absent within the mass. No atypia, pleomorphism, mitotic figures or pericellular fibrosis were noted. Evidence of polymorph infiltration was noted focally. Sections from the 'scar' showed presence of proliferating bile ductules and large thick walled arterioles [Figure 2]c. The ill-defined area of softening showed areas of necrosis [Figure 2]d. A beta-catenin immunostain was done which showed negative nuclear immunoreactivity. Immunohistochemistry for glutamine synthetase was also done showed characteristic map like areas with perivenular positivity [[Figure 2]d, inset]. Based on these features, the diagnosis of FNH was made with a suggestion that the foci of necrosis were possibly due to the effect of chemotherapy. A post-operative MRI of the child was done to exclude any post-operative collection in the abdomen, to check the viability of the residual liver tissue and to rule out any untoward vascular complications of the surgery. His post-operative scans were within normal limits. The patient has been doing well on a 4 years follow-up. FNH was first detected and described by Edmondson in 1958., It is the second most common liver cell-derived benign tumor and its incidence is just lower than that of hepatic haemangiomas. It rarely occurs in childhood and very rarely in children younger than 2 years, accounting for 0.02% of all tumors and less than 2% of hepatic tumors in pediatric age group., Although congenital FNH have been described in a few case reports,,, its occurrence at 5 months of age, as in our first case, is extremely rare. Our second case highlights the diagnostic difficulty which may be encountered on USG and trucut biopsy in differentiation of FNH from other lesions. This may often lead to administration of unwarranted chemotherapy as seen in our case. While diagnosis of FNH on surgical specimens is made outrightly as seen in our first case, its diagnosis on core needle biopsy can be extremely challenging. Primary liver neoplasms comprise 0.3–2% of all pediatric tumors with up to 75% of pediatric liver tumors being malignant. Hepatoblastoma (HB) is the most common hepatic malignancy in children, accounting for 91% of cases and primarily affecting patients who are younger than 5 years of age. The other rare pediatric liver tumors are infantile hemangioendothelioma, mesenchymal hamartomas (MH), undifferentiated embryonal sarcoma and fibrolamellar variant of hepatocellular carcinoma (FL-HCC). FNH most commonly presents as an incidentally discovered liver nodule on physical examination or during routine check-ups with normal liver enzymes., It is usually solitary, but 15-20% of cases may be multifocal. Asymptomatic cases of FNH are usually followed up closely but symptomatic patients may require surgical intervention. Till date, only one patient with FNH had recurrence after operation. Pre-operative AFP levels are a part of any routine investigations in a case of liver SOL in a child. High levels of AFP are a strong pointer in favour of HB. AFP levels in FNH are usually normal though there have been instances where FNH is associated with markedly high AFP., A small percentage of HBs, especially the small cell variants, can be associated with a low AFP level. MH may show a mild increase in the levels of AFP. It is important to differentiate FNH from the HB-fetal type, hepatocellular adenoma (HCA), well differentiated hepatocellular carcinoma (HCC) and macroregenerative nodules (MRN) on a core needle biopsy (CNB). Typical FNH often resembles biliary type cirrhosis. Atypical forms of FNH are difficult to differentiate from HCA and the presence of central stellate scar may be confused with FL–HCC and congenital hepatic fibrosis. Diagnosis of FNH can be difficult in CNBs, especially for pathologists with limited experience. The fibrous septa and bile ductules may sometimes mimic cirrhosis, which is an unlikely diagnosis at this age group. HB and FL-HCC are the most common differentials of FNH and differentiating fetal type HB from FNH on a trucut biopsy alone can be quite difficult. Both these entities show similar histological features like absence of portal tracts, mitosis or nuclear atypia. This was possibly the very problem encountered in the second case by the pathologists of the different institute. Immunohistochemical staining with beta catenin may help in these cases, as the strong nuclear immunostaining characteristic of HB is not seen in FNH. Glutamine synthetase is an important immunostain for diagnosis of FNH, which shows characteristic map like positivity with perivenular distribution and thus helps in differentiating it from other proliferating liver masses. 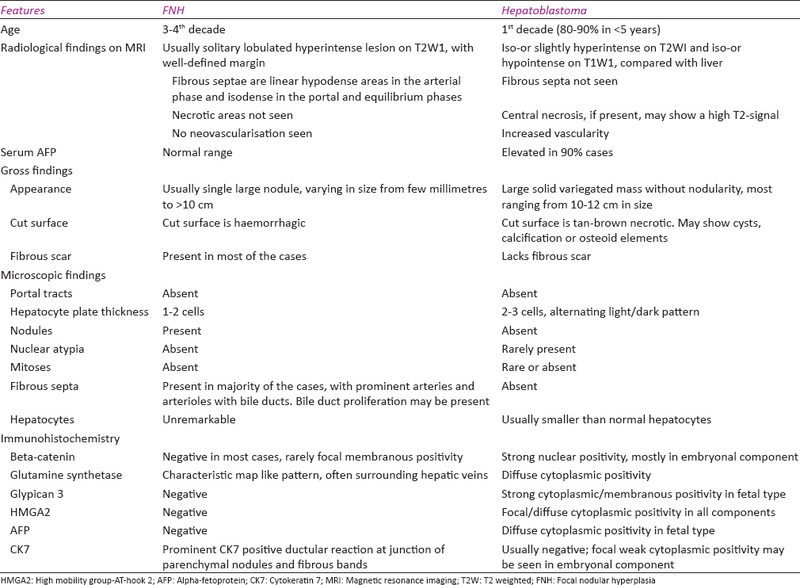 The clinicopathological differences between FNH and HB are summarized in [Table 1].,, Intratumoral necrosis as seen in our second case could be attributed to the two cycles of neoadjuvant chemotherapy administered to the patient based on the diagnosis made on trucut biopsy. We report two cases of FNH in childhood, of which the first case is a 5 month old infant, which is extremely rare. Diagnosis of FNH is often difficult on small biopsies as seen in our second case. FNH needs to be differentiated from other malignant hepatic tumours so that unwarranted neoadjuvant chemotherapy can be avoided. Immunostaining with beta catenin and glutamine synthetase can be helpful to differentiate FNH from HB and other liver SOLs. We are grateful to Prof. Puja Sakhuja and Dr. Kaushik Majumdar of G. B. Pant Institute of Post Graduate Medical Education and Research (Maulana Azad Medical College), New Delhi for their valuable help and support in performing the glutamine synthetase immunostaining of the two cases. Luciani A, Kobeiter H, Maison P, Cherqui D, Zafrani ES, Dhumeaux D, et al. Focal nodular hyperplasia of the liver in men: Is presentation the same in men and women? Gut 2002;50:877-80. Reymond D, Plaschkes J, Lüthy AR, Leibundgut K, Hirt A, Wagner HP, et al. Focal nodular hyperplasia of the liver in children: Review of follow-up and outcome. J Pediatr Surg 1995;30:1590-3. Ishak KG, Goodman Z, Stocker JT. Tumors of the liver and intrahepatic bile ducts. In: Atlas of Tumor Pathology. Fascicle 31. Ser. 3. Washington, DC: Armed Forces Institute of Pathology; 2001. p. 30-9. 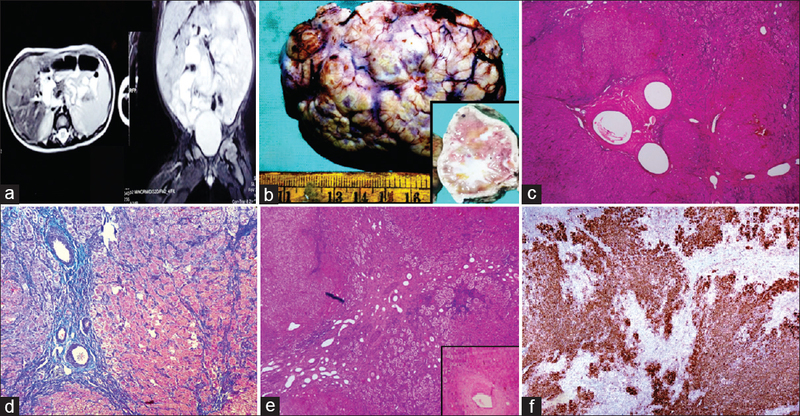 Nguyen BN, Fléjou JF, Terris B, Belghiti J, Degott C. Focal nodular hyperplasia of the liver: A comprehensive pathologic study of 305 lesions and recognition of new histologic forms. Am J Surg Pathol 1999;23:1441-54. Kang J, Choi HJ, Yu E, Hwang I, Kim YM, Cha HJ. Acase report of fetal telangiectatic focal nodular hyperplasia. Pediatr Dev Pathol 2007;10:416-7. Okamura N, Nakadate H, Ishida K, Nakahara S, Isobe Y, Ohbu M, et al. Telangiectatic focal nodular hyperplasia of the liver in the perinatal period: Case report. Pediatr Dev Pathol 2005;8:581-6. Petrikovsky BM, Cohen HL, Scimeca P, Bellucci E. Prenatal diagnosis of focal nodular hyperplasia of the liver. Prenat Diagn 1994;14:406-9. Li AJ, Zhou WP, Wu MC. Diagnosis and treatment of hepatic focal nodular hyperplasia: Report of 114 cases. Zhonghua Wai Ke Za Zhi 2006;44:321-3. Becker YT, Raiford DS, Webb L, Wright JK, Chapman WC, Pinson CW. Rupture and hemorrhage of hepatic focal nodular hyperplasia. Am Surg 1995;61:210-4. Di Carlo I, Urrico GS, Ursino V, Russello D, Puleo S, Latteri F. Simultaneous occurrence of adenoma, focal nodular hyperplasia, and hemangioma of the liver: Are they derived from a common origin? J Gastroenterol Hepatol 2003;18:227-30. Stocker JT, Ishak KG. Focal nodular hyperplasia of the liver: A study of 21 pediatric cases. Cancer 1981;48:336-45. Zhuang L, Ni C, Din W, Zhang F, Zhuang Y, Sun Y. Huge focal nodular hyperplasia presenting in a 6-year-old child: A case presentation. Int J Surg Case Rep 2016;29:76-9. Finley AC, Hosey JR, Noone TC, Shackelford DM, Varadarajulu S. Multiple focal nodular hyperplasia syndrome: Diagnosis with dynamic, gadolinium-enhanced MRI. Magn Reson Imaging 2005;23:511-3. Mneimneh W, Farges O, Bedossa P, Belghiti J, Paradis V. High serum level of alpha-fetoprotein in focal nodular hyperplasia of the liver. Pathol Int 2011;61:491-4. Cirri L, Dahmash F, Marin C, Grüning W, Elmaagacli A. Exaggerated serum levels of alpha-fetoprotein in focal nodular hyperplasia of the liver. Gastroenterol Insights 2016;7:15-6. De Ioris M, Brugieres L, Zimmermann A, Keeling J, Brock P, Maibach R, et al. Hepatoblastoma with a low serum alpha-fetoprotein level at diagnosis: The SIOPEL group experience. Eur J Cancer 2008;44:545-50. Fabre A, Audet P, Vilgrain V, Nguyen BN, Valla D, Belghiti J, et al. Histologic scoring of liver biopsy in focal nodular hyperplasia with atypical presentation. Hepatology 2002;35:414-20. Bera G, Das RN, Islam N, Roy P, Mishra PK, Datta C, et al. 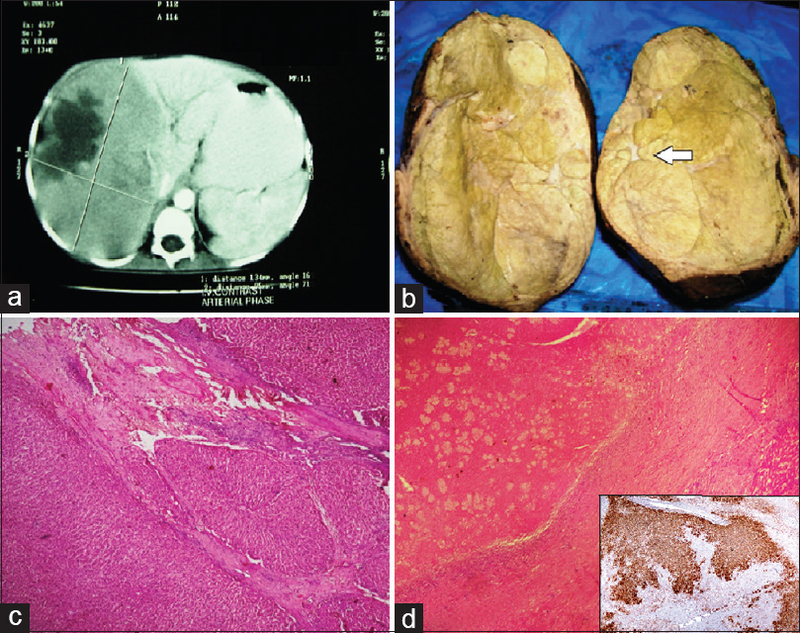 FNAC aided diagnosis and categorization of hepatoblastoma: A report of three cases. Diagn Cytopathol 2017;45:77-82. Bera G, Das RN, Roy P, Ghosh R, Islam N, Mishra PK, et al. Utility of PAS and β-catenin staining in histological categorisation and prediction of prognosis of hepatoblastomas. Pediatr Surg Int 2017;33:961-70. Makhlouf HR, Abdul-Al HM, Goodman ZD. Diagnosis of focal nodular hyperplasia of the liver by needle biopsy. Hum Pathol 2005;36:1210-6. Washington K, Harris E. Masses of the liver. In: Mills SE, editor. Sternberg's Diagnostic Surgical Pathology. 5th ed. The People's Republic of China: Lippincott Williams & Wilkins; 2010. p. 1546-73. Koehne de Gonzalez AK, Salomao MA, Lagana SM. Current concepts in the immunohistochemical evaluation of liver tumors. World J Hepatol 2015;7:1403-11. Chen ZE, Lin F. Application of immunohistochemistry in gastrointestinal and liver neoplasms: New markers and evolving practice. Arch Pathol Lab Med 2015;139:14-23.